Jimmy Van Heusen was a favorite composer of both Bing Crosby and Frank Sinatra, who recorded more than 70 of his songs. As a teenager he adopted the more sophisticated name of the shirt manufacturer when he began singing and playing piano on a Syracuse radio station. In college he wrote a song with Jerry Arlen (Harold’s brother) which was recorded by Cab Calloway. He wrote “Oh! 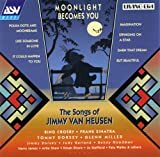 You Crazy Moon” (1938) and “Deep in a Dream” (1939) with lyricist Eddie De Lange and came up with two hits from a failed Broadway show in 1939: “Darn That Dream” with De Lange and “I Thought About You” with Johnny Mercer. The following year he formed a fruitful partnership with lyricist Johnny Burke. Writing for Hollywood movies, they produced a string of hits for Bing Crosby--“Moonlight Becomes You” (1942), “Sunday, Monday, or Always” (1943), the Academy-Award winning “Swinging on a Star” (1944) and “Personality” (1946). Three films in 1944 produced “Suddenly It’s Spring,” “It Could Happen to You,” and “Like Someone in Love.” Two more of their hits to be picked up by jazz musicians are “Polka Dots and Moonbeams” (1940) and “But Beautiful” (1947). “Here’s That Rainy Day” (1953), introduced by Dolores Gray in Carnival in Flanders, was popularized by nightclub singers and recorded by a host of jazz artists. In 1954 Sinatra hired Van Heusen to collaborate on a television adaptation of Our Town with lyricist Sammy Cahn which resulted in the Emmy-Award winning “Love and Marriage.” Cahn and Van Heusen wrote a variety of hit tunes from the swinging “The Tender Trap” (1955), “Come Fly with Me” (1958) and “My Kind of Town” (1964) to the contemplative “The Second Time Around” (1960) and the dark ballads “Only the Lonely” (1958) and “September of My Years” (1965). Their partnership also produced three Academy-Award winners: “All the Way” (1957), “High Hopes” (1959), and “Call Me Irresponsible” (1962). Oscar Peterson Includes "Polka Dots..."
DVD Includes "Moonlight Becomes You"
DVD Includes "Swingin' on a Star"
VHS Includes "Call Me Irresponsible"